Please note that Statements of SEN will be replaced by Education, Health and Care (EHC) plans between September 2014 and April 2018. A Statement is a document which sets out a child’s SEN and any additional help that the child should receive. The aim of the Statement is to make sure that the child gets the right support to enable them to make progress in school. A Statement is normally made when all the educational provision required to meet a child’s needs cannot reasonably be met by the resources within a child’s school at School Action or School Action Plus (known as Early Years Action or Early Years Action Plus in Early Years Settings). Most children with SEN should have their needs met within a mainstream school. Before a Statement will be considered, additional help may be provided to the child at School Action. If the child still does not seem to be making enough progress then the school may seek advice from external professionals at School Action Plus. If this additional help is still not enough then the child's school or parents can apply to the LEA for a Statutory Assessment of the child’s SEN in order to try and obtain a Statement of SEN.
"WHAT IS A STATUTORY ASSESSMENT?" In order to get a Statement of SEN for a child, the LEA must first conduct a Statutory Assessment. A Statutory Assessment is a multi-disciplinary investigation to try and discover what the child’s needs are and then determine what provision is needed to meet those needs. The LEA will request "advice" from the child's parents, the child's school (or any other education settings or any other education professionals involved), a medical professional (usually a paediatrician), an Educational Psychologist, Social Services and any other relevant professional considered necessary such as a teacher for Hearing Impairment, a teacher for Visual Impairment, a Speech and Language Therapist etc. If after considering all of the evidence received the LEA decides that the child’s needs cannot be met solely through school-based provision they may decide to issue a Statement of SEN.
A Statutory Assessment does not always result in a Statement and if the LEA decides not to issue one, they may issue a Note in Lieu, explaining why they have decided not to issue a Statement. "WHAT IS IN A STATEMENT?" The Statement should describe what the child’s needs are, the objectives to be achieved, the provision required to meet those objectives, the monitoring arrangements, what school (or other placement) the child will attend and the child's non-educational needs and how these will be met. Part 6: Describes how the child will get help to meet any non-educational needs. You can see how a Statement should be set out by clicking here. Parents are always sent a proposed (or draft) Statement to comment on before a final Statement is issued. At the proposed stages parents have the right to express a preference for the school they would like their child to go to and to be recorded in Part 4 of the Statement. Statements are reviewed yearly at an Annual Review, which the parents are invited to take part in, which will decide whether or not the Statement needs to be amended or ceased. "WHAT ARE THE TIME SCALES FOR A STATEMENT?" The whole process for getting a Statement aims to be completed within 26 weeks. An LEA has 6 weeks in which to respond to a request by a child’s school or parents for a Statutory Assessment. The Statutory Assessment itself should take 10 weeks to complete (although the parents are normally only given 29 days to provide their advice) with a further two weeks for the LEA to reach a decision on whether or not to make a Statement. If making a Statement, the LEA will issue the proposed Statement to the parents who have 15 days in which to respond with their representations and preference for a school and the LEA then has 8 weeks (including these 15 days) to issue a final Statement. "DO PARENTS HAVE ANY RIGHT OF APPEAL?" 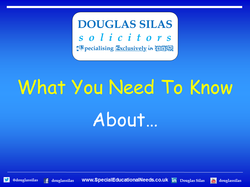 If an LEA decides not to conduct a Statutory Assessment, issue a Statement, or if a parent is unhappy with the contents of either Parts 2, 3 and/or 4 of the Statement then they will have a right to appeal to the SEND Tribunal (Special Educational Needs and Disability Tribunal). Where parents do not think that the provision set out is meeting their child’s needs they can request a Statutory Reassessment. If this is declined or they disagree with any final new/amended Statement they can also appeal to the SEND Tribunal. Parents also have a right to request the LEA to change the name of the school in Part 4 of the Statement and to appeal against any refusal (provided the school being requested is a maintained one). Parents also have a right to appeal against any decision by an LEA to cease to maintain a Statement. An appeal must be lodged with the SEND Tribunal within 2 months of the date of receipt of a decision letter from the LEA.